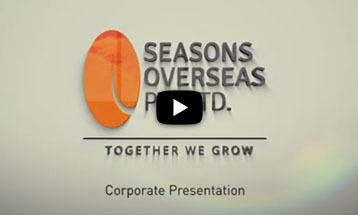 The Seasons Overseas Group was established in July 2013 to service the growing demand in high quality agricultural products, focusing on Pulses, Sugar, Grains, Oil Seeds and Animal Feed / Meals. We have offices in Singapore, Myanmar and India, as well as partnered offices in Cambodia and Nepal. We have made significant progress in the last 3 years and have executed trades with volumes of over 225,000 metric tons annually. We have an active buyer and seller network with over 200 corporations around the world. Soon, we will have more partnered offices, originating from Canada, Australia, Africa and other regions. SOPL is constantly striving to bring together all its stakeholders, while also working towards creating an ethical business environment and supporting fair trade practices.